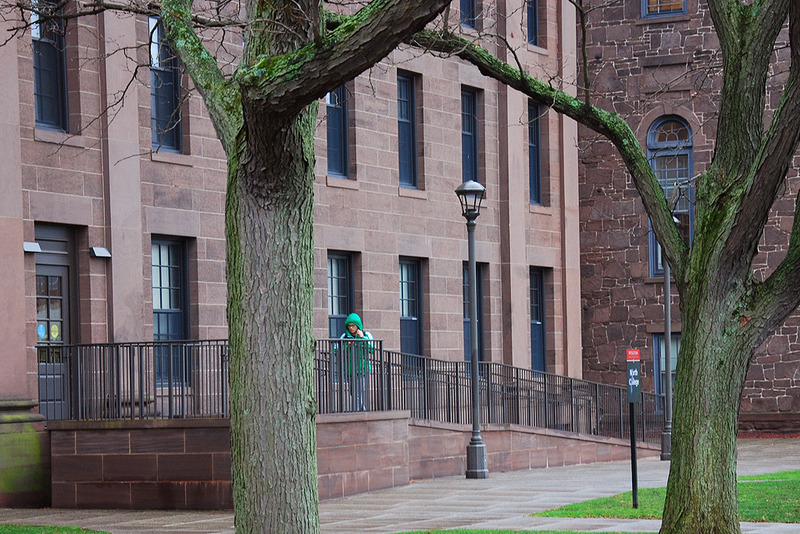 This guest post was co-written by Shizuha Hatori ’18 and Yao Ong ’18 and addresses proposed administrative restructuring of the Office of International Student Affairs. As part of a restructuring of services for international students, Wesleyan is making two new hires: a “professor of the practice” position for an ESL writing specialist, and an entry-level administrative position for a person intended to be in charge of international student affairs and responsible for some of the clerical duties in the office. These two “new” positions are meant to play roles that Professor Alice Hadler has been fulfilling competently for many years. This reorganization, on which she was not consulted, was tantamount to forcing Professor Hadler into retirement. Posted by wilk on May 5, 2018 at 5:23 PM. 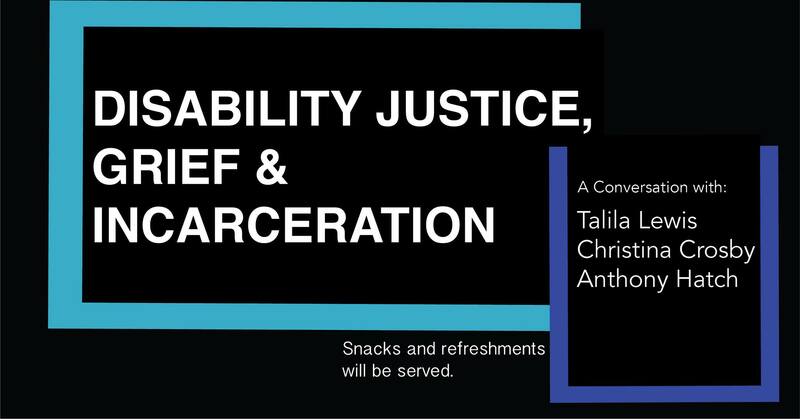 Join us for a discussion on disability justice, including intersections of race, class, and sexuality as related to disability, and mourning and grief in relation to disability and the carceral setting. Talila Lewis (TL) does anti-violence, decarceration and prison abolition work that highlights and addresses the nexus between race, class, disability and structural inequity–focusing in particular on people with multiply marginalized identities. As the creator of the only national deaf prisoner database, Talila advocates with and for hundreds of deaf defendants and incarcerated and returned individuals. Joined by Christina Crosby, Wesleyan Professor of Feminist, Gender, and Sexuality Studies and English, and Anthony Hatch, Wesleyan Professor of Science in Society, African American Studies, and Sociology. The Harriet Tubman Collective’s (of which TL is a founding member) website. 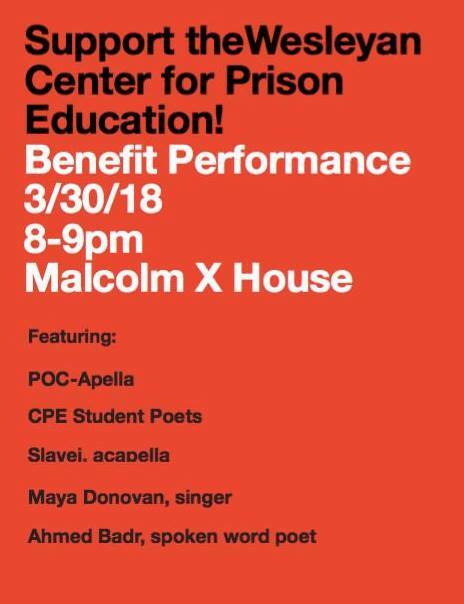 Sponsored by Wesleyan Students for Ending Mass Incarceration, The Resource Center, Adelphic Education Fund, Science in Society Department, American Studies Department, Feminist, Gender, and Sexuality Studies Department, and SALD. Posted by wilk on April 15, 2018 at 8:24 PM. I’m displeased. 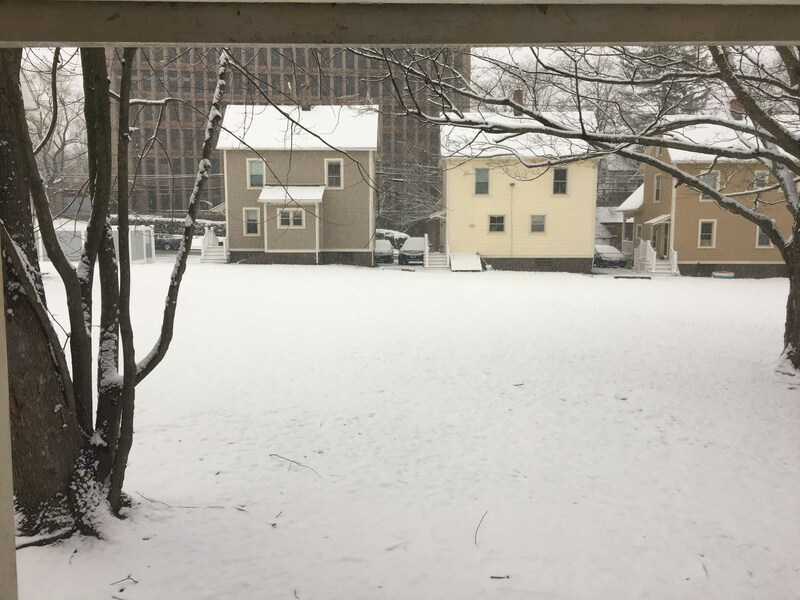 I woke up at 7AM this morning, ready to start the day off right, but was unable to do that because I looked out my window to the sight of several inches of snowy sorrow. Posted by wilk on April 2, 2018 at 9:27 AM. 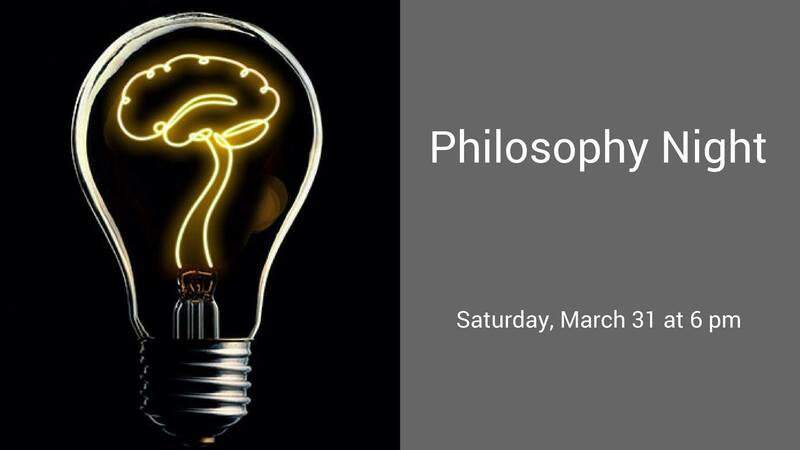 Join us the last Saturday of each month for a night of reflective discussion! We will examine ideas together, and share our thoughts on a question generated by the group. All attendees can choose to contribute one question as they arrive. The group will then vote on which question to discuss. Moderated by Christopher DeSena, Assistant Course Materials Manager, Wesleyan RJ Julia Bookstore. Posted by wilk on March 28, 2018 at 11:51 AM. Williams-Mystic? is an interdisciplinary semester program focused on the ocean and coastal studies. Run by Williams College, we are based at the Mystic Seaport Museum? in Mystic, CT.
exploring the bayous and barrier beaches of Southern Louisiana? ; and sailing on a tall ship for 10 days on the open ocean.? We embrace place-based learning at these different field sites, allowing students to encounter a human perspective on the environmental issues we study (speaking with oyster fishermen on the West Coast, to community leaders facing land subsidence and sea level rise in coastal Louisiana, and everyone in between). We are a member of the Twelve College Exchange and have enjoyed having dozens of Wesleyan students join us over the course of our 40-year history. Posted by wilk on March 28, 2018 at 11:47 AM. Looking for something fun and meaningful to do after dinner this Friday? In 2009, Wesleyan undergraduates formed the Center for Prison Education with the belief that incarcerated individuals should have access to high quality educational resources. Since then, the CPE has since brought the transformative power of the liberal arts to over 125 women and men in maximum security prisons. Peer tutoring remains at the heart of the CPE’s work and scores of campus undergraduates have volunteered with the program, working side-by-side with their colleagues in Cheshire and York Correctional Institutions. In an effort to make this opportunity more widely available, we are asking your help to fund stipends for student tutors with limited financial means. Come one, come all! We will be accepting donations via cash and Venmo. Posted by wilk on March 28, 2018 at 11:32 AM. The record-holding two-time National Basketball Association champion reflects on his work ethic, his on-the-court friendships and rivalries, the great teams he’s played for, and what it takes to have a long and successful career in this thoughtful, in-depth memoir. Playing in the NBA for eighteen years, Ray Allen won championships with the Boston Celtics and the Miami Heat and entered the record books as the original king of the three-point shot. Known as one of the hardest-working and highest-achieving players in NBA history, this most dedicated competitor was legendary for his sharp shooting. From the Outside, complete with a foreword by Spike Lee, is his story in his words: a no-holds-barred look at his life and career, filled with behind-the-scenes stories and surprising revelations about the game he has always cherished. Allen talks openly about his fellow players, coaches, owners, and friends, including LeBron James, Kobe Bryant, and Kevin Garnett. He reveals how, as a kid growing up in a military family, he learned about responsibility and respect—the key to making those perfect free throws and critical three-point shots. From the Outside is the portrait of a gifted athlete and a serious man with a strongly defined philosophy about the game and the right way it should be played—a philosophy that, at times, set him apart from colleagues and coaches, while inspiring so many others, and lead to the most pivotal shot of his career: the unforgettable 3-pointer in the final seconds of Game 6 of the 2013 NBA finals against the San Antonio Spurs. Throughout, Allen makes clear that success in basketball is as much about what happens off the court as on, that devotion and commitment are the true essence of the game—and of life itself. Ray Allen, the most prolific three-point shooter of all time, played in the NBA for 18 years, winning two championships (2008 Boston Celtics, 2013 Miami Heat). Allen, who went to the University of Connecticut, was the 1996 Big East Player of the Year. As a pro, he averaged more than 20 points a game for 10 straight seasons. 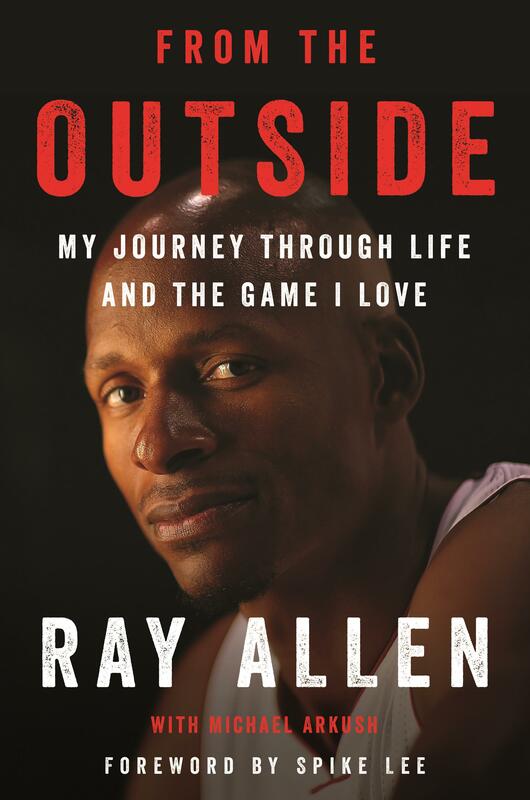 $27.99, includes admission to the book signing and (1) copy of From the Outside, which Ray will sign at the book signing. Posted by wilk on March 28, 2018 at 11:24 AM. Guess who came to the good-ol’ M-Town right before Spring break? If you guessed your hallmate’s mom (because like, let’s be real, your hallmate needs an intervention), then you are very close. This weekend, a rather eclectic (lol) bunch of folks arrived on campus via sky dive (I wish). The Board of Trustees is had the first of their meetings this year! 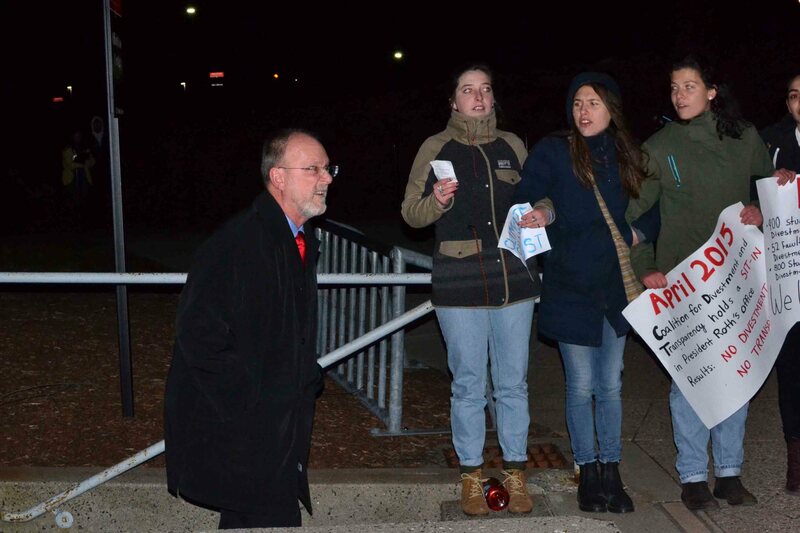 If you ever forget when the meetings are, just think about the weekend before Wesleyan goes on break, and the Board of Trustees are likely meeting. Their next meeting will be in May around Reunion & Commencement. Well, as this semester has already started off with some extremely valid frustration, I thought it would be appropriate that we reminded everyone who the Board of Trustees are, what their job titles are, and how you might be able to contact them. Turns out, their names and jobs are publicly available on the Wesleyan website, and their emails are too (on Wesconnect, via the ‘Networking’ tab). Thanks Zach for doing this first when students were frustrated about need blind being axed a couple years ago. Posted by wilk on March 4, 2018 at 11:37 AM. Come audition for a Cardinal Pictures short film, “On The Edge”! Written by Sage Marshall, “On The Edge” is about a couple traveling in the woods who reach a crossroads that brings their relationship into question. 1 MAN and 1 WOMAN. 20-30 years old, outdoorsy. Must be comfortable singing around a campfire (no singing experience necessary!). Both auditions will be located in the Theater Studios in the Jones Room (TST101). Actors MUST be available to film in the evening of Friday, April 13th (after class) and throughout the entirety of Saturday, April 14th and Sunday, April 15th. Posted by wilk on February 27, 2018 at 10:37 AM. How do we face disasters? Sometimes we live through them, other times we experience them indirectly from a distance. How can we make such distances malleable? How can we transform ourselves from being passive observers to agents of change? 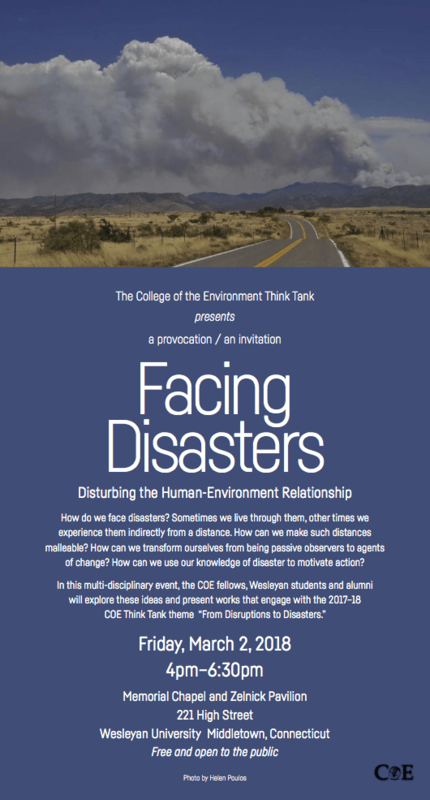 How can we use our knowledge of disaster to motivate action? Posted by wilk on February 27, 2018 at 10:32 AM.